I so prefer the outfit with the black skirt. I think there are a few things about it that make it the far better outfit. One would be the black color of the skirt. I think that it totally makes the white and black zig-zag stripes totally pop. It also makes the few purple zig-zag stripes also far more noticeable. Another thing I really like is the use of the belt. The wide belt at the smallest part of my torso really draws in the eye and helps adds to the illusion of hips. I am not wearing any hip pads in either outfit, but I think with the black skirt it actually looks like I have a bit of hip! Woo-Hoo. I also think the slightly higher length of the black skirt is more flattering. With the skirt hitting my legs right there it also helps to add to the illusion of having hips, as well as showing the curves of my calves far more than the jean skirt. 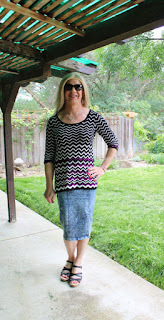 Another benefit of the outfit with the black skirt is the style of wedge that I am wearing. The shoes allows for most of my feet to be showing, this combined with the higher length skirt really helps to make my legs look longer. The sandals with the straps happens to cut my feet off at a higher location and thus giving the appearance of a shorter leg. So.... Those are my thoughts about it, what about you? Am I missing something forgiving about the outfit with the jean skirt? I agree with you, the black skirt outfit works better. For all the reasons you mentioned. I also wanted to say it's cool to see some posts from Jules, too, even if I can't always think of anything to say (that goes for some of your posts, too, Nadine). Thank you for commenting about Jules as well. I feel the same way about posts I read. Hmm.... I wish I always had something relevant to say. Oh well! I like the way you break down each of the elements - sandal straps, belt, fall of the hemline, etc - in assessing the ensemble. And I totally agree! The jean skirt might help if you needed a more casual look, but you could probably do that with just the sandals. Thanks! In assessing my outfit choices it is often a pull between style and emotion within me. When I first began to dress it was almost entirely emotional and I looked a mess! Now I really try and view each of the various elements in an outfit when visually I can take a step back and try and determine why something looked better or worse than I thought it did when I chose to put it on! I agree for all of the same reasons, but especially, the belted waist and the hips! I know right! Where did those hips come from?? I love it when clothing illusions come together! Hi Nat! Thanks so much! I love the black skirt outfit. I think the belt is part of it. Perhaps it is also how you are standing. Anyhow, it makes you look very slender. The black skirt looks quite dressy with that top. Hi Jjjjohanne! I totally agree with your assessment. I was pondering the stance as making a difference as well.